English surveyor and soldier; born March 15, 1869; killed in action in Bechuanaland April 6, 1897. 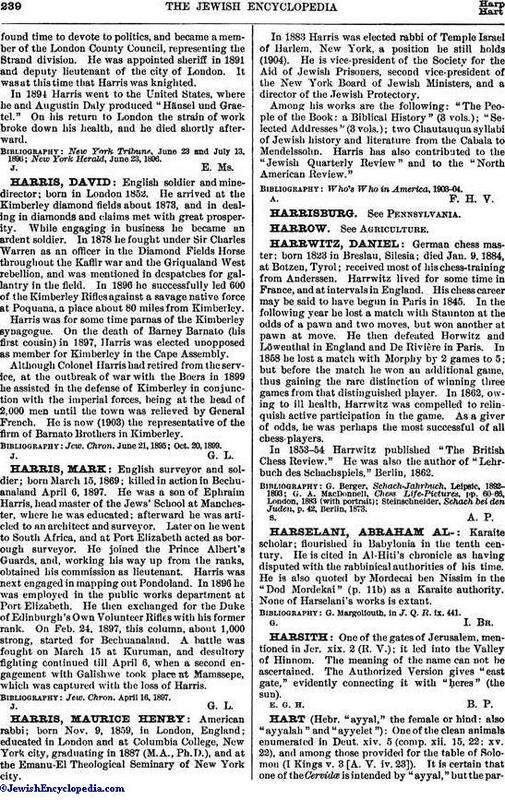 He was a son of Ephraim Harris, head master of the Jews' School at Manchester, where he was educated; afterward he was articled to an architect and surveyor. Later on he went to South Africa, and at Port Elizabeth acted as borough surveyor. He joined the Prince Albert's Guards, and, working his way up from the ranks, obtained his commission as lieutenant. Harris was next engaged in mapping out Pondoland. In 1896 he was employed in the public works department at Port Elizabeth. He then exchanged for the Duke of Edinburgh's Own Volunteer Rifles with his former rank. On Feb. 24, 1897, this column, about 1,000 strong, started for Bechuanaland. A battle was fought on March 15 at Kuruman, and desultory fighting continued till April 6, when a second engagement with Galishwe took place at Mamssepe, which was captured with the loss of Harris. Jew. Chron. April 16, 1897.